The Baja 3.0 knife is the result of simple design and fine execution. The lines are simple yet effective. The 3 inch blade can adequately handle a wide variety of tasks, such as fashioning wooden implements, building fire and shelter, or taking an animal apart. The 1/8" thick, 1095 high carbon steel can take a long slice with ease. 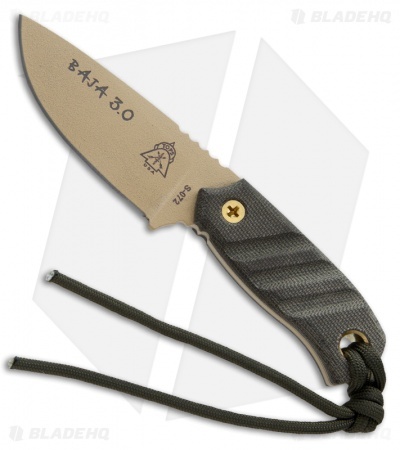 The simple handle design with its grooved green canvas Micarta scales, enables the user excellent traction in most circumstances. TOPS has taken the time to develop a high quality steer hide sheath, which can be worn horizontally or vertically on your belt or easily tied to your pack. little bugger for finesse work when I’m also packing a monster blade for the mean stuff. Git yoo wun! I was researching a lot of different discrete fixed blade knives before I bought this one. 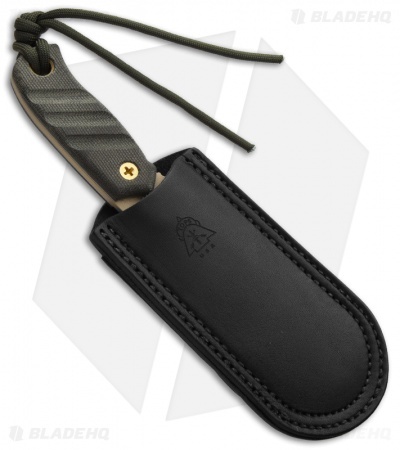 It has a sleek profile for it's size and comes in a very nice leather sheath which was a huge seller for me because I can't stand kydex sheaths for knives and their overly strong tension clips. If you grip down hard on the handle, it's not quite comfortable but you won't lose it. It's full flat ground, and the micarta is fairly contoured. I love that you can carry this on you belt vertically or horizontally. The jimping on this isn't my favorite and I could do without it. Also, where the grind meets the plunge line or bevel, it is a bit uneven on the one side. I would still highly recommend this knife even with the couple above mentinoned quirks. This is a great knife to add to a collection of EDC or camping/hiking knives. It arrived sharp with a leather sheath that surprisingly held this knife securely in place. The quality is evident but expected with TOPS knives. I have medium size hands so this knife works extremely well for me, but if you have large hands the handle may be somewhat small. The jimping on the blade allows for slightly more space and adjustment of hand placement. The finger notch is sized well and prevents my finger from crossing the blade. Overall, I love this little knife! It has many uses both in the wilderness and EDC. This is perfect for those that what to carry a fixed blade everyday. It is amazing. Also the sheath is a thing of beauty. You can literally carry it any way you see fit in the sheath.